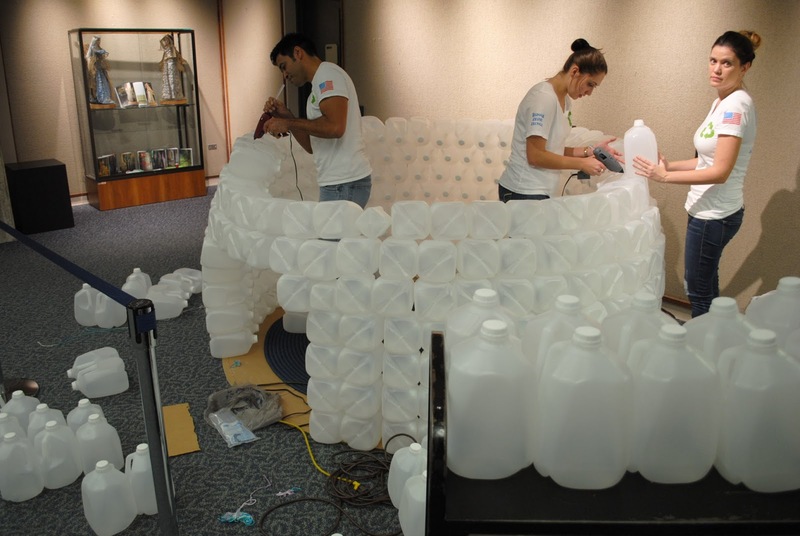 To make this fun REading Igloo out of milk jugs we used 430 milk jugs, a giant card board box, a 80 inch round rug, hot glue guns and hot glue. We used high temperature hot glue guns with high temperature glue sticks. We also supplemented with 6 half milk jugs, to fill in. To prep for our build, we glued the milk jugs together in two’s. When gluing milk jugs together make sure you glue the handles together. 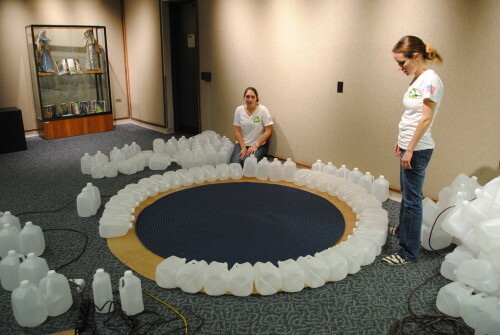 You will need to hold the milk jugs together for about 60 sec. When you start gluing the sets of together, glue the top of the milk jugs together so there is a little space between them. The rows will start to get smaller. Some rows will need a half gallon milk jug. 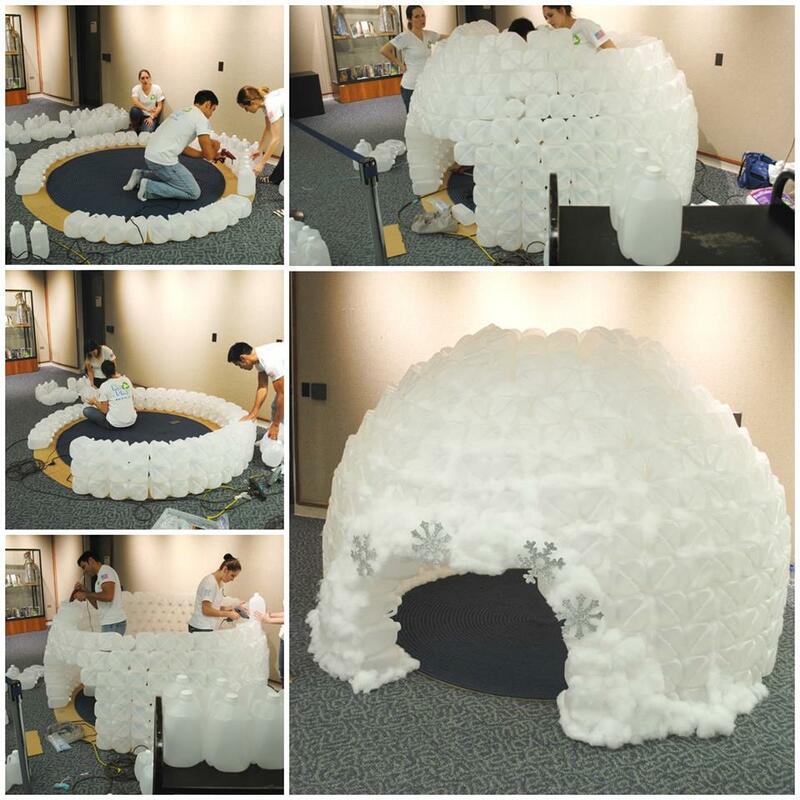 This will very on how big you are making your igloo. We added our first half gallon on the fourth row. About the 5th row you will need to start pushing the milk jugs in a little bit.By the seventh row you should start to see it start to curve inwards. We started our door way on row 6. We added a support milk jug on the right side of the entrance. On the 10th row the milk jugs should be pointing down. We ended up with a total of 12 rows. We did run out of milk jugs, so we had a sky light. 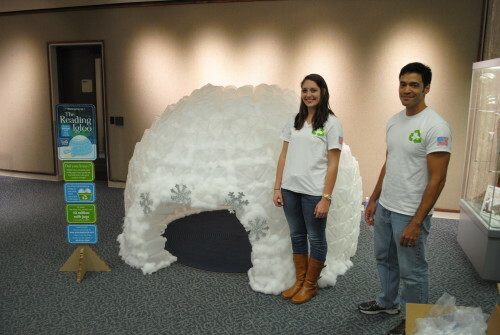 Which actually worked out well – gives some air and circulation to the igloo and the igloo can get a tad be stuffy. You can leave a hole or cover it completely that’s up to your preference. .We finished the look with buffalo snow, snow flakes and a Re-Play sign. You could also decorate it with cut outs for winter holidays! 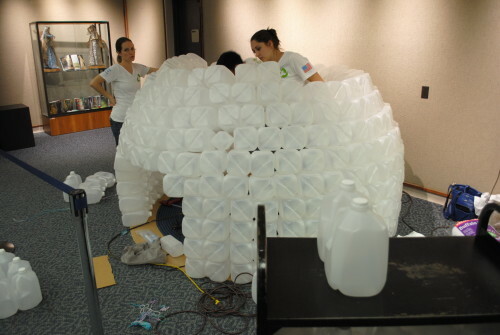 This Igloo took 4 people around 5 hours to assemble. 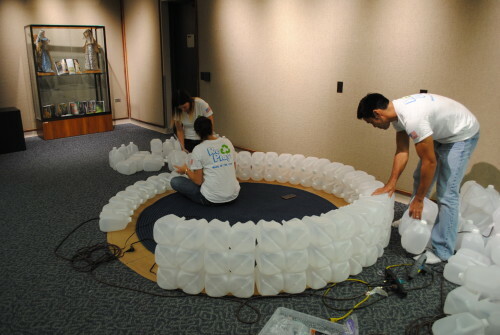 We put the pairs of milk jugs together over time. 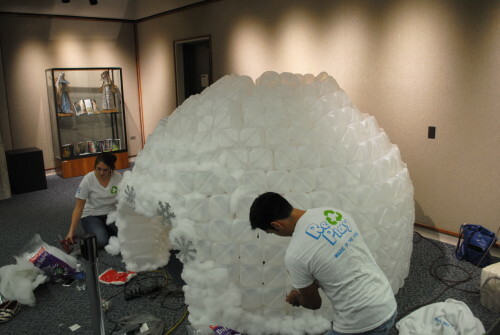 It was a ton of fun and we encourage you to try this at your local Library or School Library. 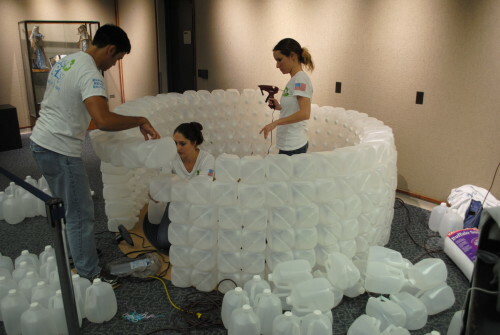 It’s a great way to teach little ones about recycling and how they can help make a cleaner world. 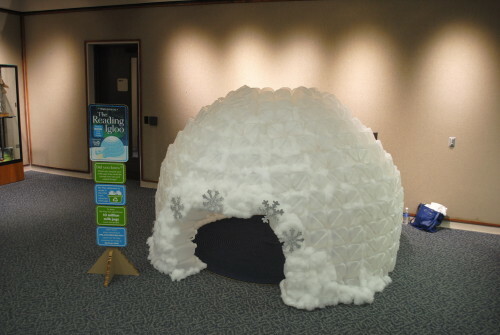 Kids and adults will sure to love this fun reading Igloo.